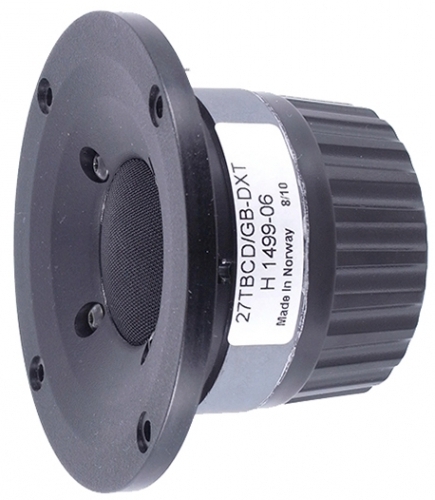 The 27TBCD/GB-DXT is an aluminium/magnesium alloy dome tweeter with a DXT® (Diffracton Expansion Technology) lens. The DXT® tweeter addresses the major issues regarding directivity control in traditional loudspeaker designs. DXT® solves several well-known issues regarding; directivity control, off-axis response, integration with midrange units and baffle diffractions. From approximately 7 kHz the diffraction edges begin to work. 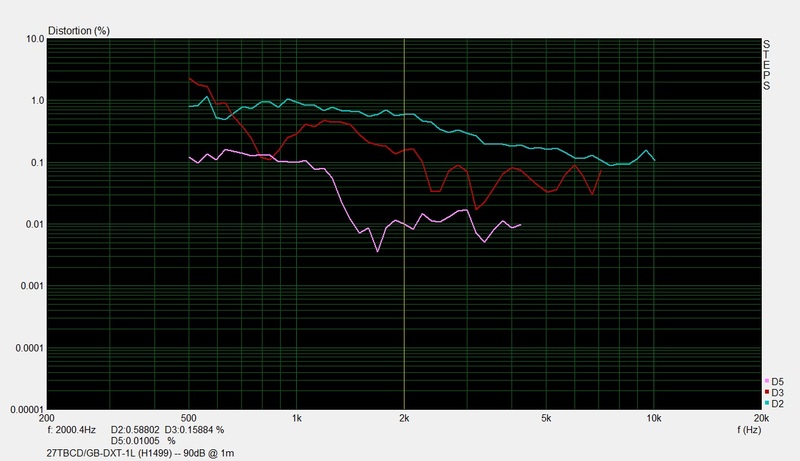 At the very high frequencies the DXT® uses up to 3rd order diffraction to expand the sound ﬁeld. At lower frequencies the DXT® tweeter operates as a waveguide to narrow the mid-band dispersion. Stiff and stable rear chamber with optimal acoustic damping allows the tweeter to be used with moderately low crossover frequencies. A ﬁne mesh grid protects the diaphragm. 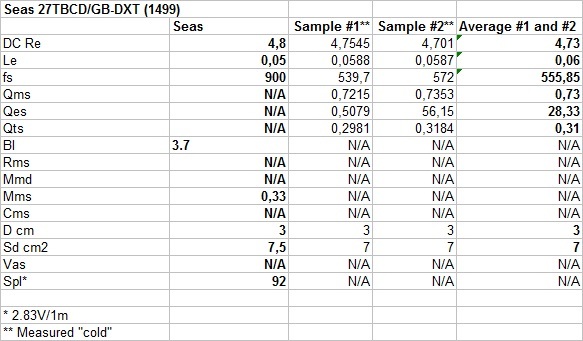 Lower resonance frequency than the official SEAS specification and showing a 5% variation between the two driver unit samples. The DXT tweeter doesn’t use ferro-fluid in the magnetic gap. The double peak in the impedance plot indicates some sort of cavity resonance. 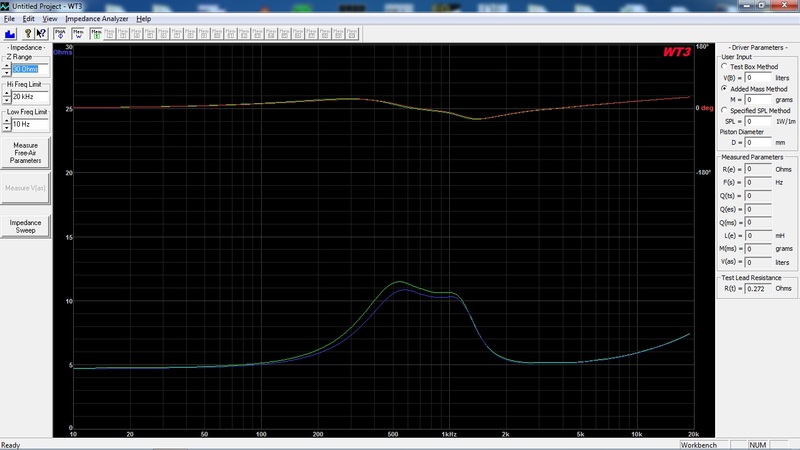 The impedance plot shows a slight variation between the two driver unit samples. Overall a good consistency between the two samples. Driver position: Mounted on center-line with driver unit center 8cm from the top of the baffle. Virtually the same frequency response between the two samples except for some sort of cancelation for sample 1 at 21kHz. Between 1.5-4kHz the baffle diffraction is noticed as dips and peaks in the frequency response. This is reduced in the off-axis measurements. The tweeter has a sharp peak centered at 27kHz which is caused by the hard dome cone break-up. This cone break-up behavior is very common among hard dome tweeters and is often noticed as increased odd-order distortion between 5-10kHz, depending where the cone breakup occurs. Many people refers this as “sounding metallic”, while others claim it can’t be heard. Thanks to the DXT lens the tweeter has a remarkable controlled off-axis response and frequency dispersion! The odd-order harmonics are very low throughout the tweeters usable frequency range. The harmless 2nd order harmonics is a bit elevated compared to the odd-order harmonics. Unfortunately however, due to the measurement setup these distortion plots don’t tell the whole truth about this tweeters distortion profile. The cone break-up at 27kHz causes a rise in the distortion profile at 13.5kHz for the second-order, 9kHz for the third-order and 5.4kHz for the fifth-order harmonics and so on. To sum up, this is a very interesting and affordable low distortion tweeter. Thanks to the DXT lens it has an exceptional controlled off-axis response and frequency dispersion. The DXT tweeter can be used down to 2kHz, perhaps even lower than with an appropriate steep filter.